ColSimCSP is a simulation software tool developed at Fraunhofer ISE for dynamic thermal simulations which allows the integration of complex operating strategies. The performance models are based on the two plant layouts namely the indirect integration of the molten salt storage with thermal oil as heat transfer fluid which is used with PTC and LFC technologies, as well as, the direct storage with molten salt as heat transfer and storage fluid which is used with CRS and PTC technologies. The following schematic shows the implemented CSP plant configurations and their temperature level. Additionally, detailed performance models for different cooling system technologies were added to the software. These include the direct deluged condenser and the conventional air and water cooled condensers (ACC and WCC). 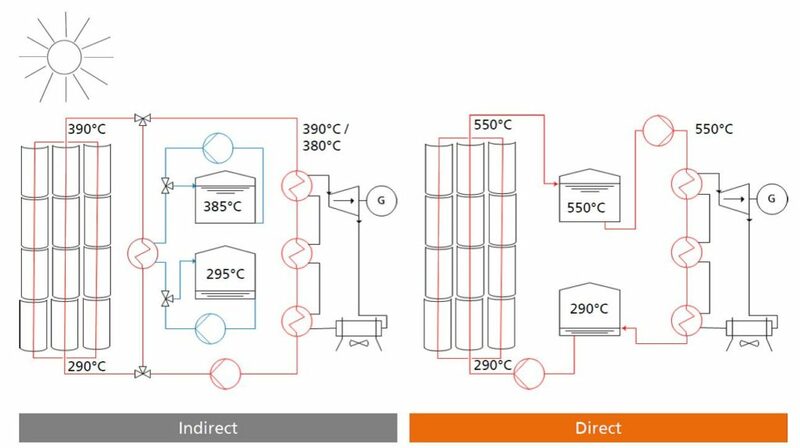 The cooling system models are able to simulate the condenser pressure and temperature in full load and part load operation modes, as well as, the water losses including evaporation, blowdown, and drift. Following figures show the exemplary annual simulation results of ColSimCSP for a 100 MW reference CSP plant in Upington, South Africa. The performance models have been partly validated against measured data of commercial large scale CSP plants. The result of the validation has been published in Solar Energy journal (Rohani et al., 2017) and is available to download under this link: https://bit.ly/2C54jF2. Since the validation is performed against a wide range of real operating data from a variety of months and days with different weather conditions, the models can be used for annual yield assessment, technology evaluation, and optimisation of operating strategies for a variety of locations and weather conditions. Fraunhofer is Europe’s largest solar energy research institution. In the solar thermal field, Fraunhofer ISE is pursuing R&D on materials research and component development for both improved flat-plate and concentrating collectors since about 15 years, but also on process integration and systems.